Lifetime Storage Building - 11 ft. x 21 ft. Outdoor Garage Shed - Model 60237 (formerly 60026). Free shipping for this Lifetime shed when shipped to the 48 United States. Have an extra car sitting outside you want to protect from the elements? 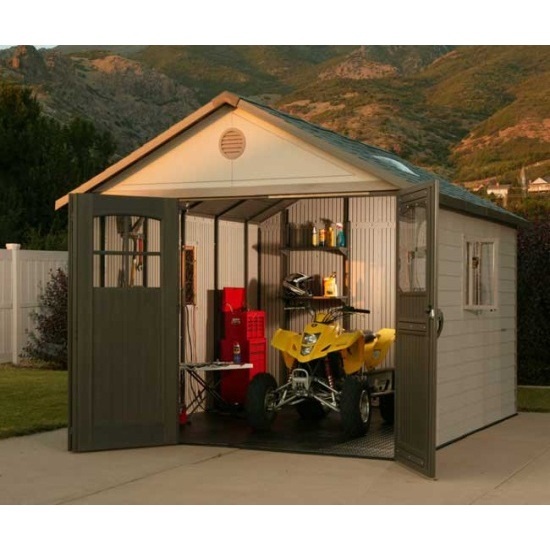 This tri-fold door garage shed from Lifetime Products provides an excellent option for your storage needs. The floor plan measures 11 ft. wide and 21 ft. long. The tri-fold doors open up 9 ft. of entrance space, allowing you to park and store most cars with ease. This Lifetime storage building uses steel reinforcements for the frame and polyethylene plastic for the walls, roof, and floors. Plenty of natural light can enter the shed through 6 windows and 2 large bubble sky lights. Best of all, the shed is made in the U. S. A. If you are putting this on a concrete slab you'll want the slab to measure at least 123.5" wide x 243.5" deep. No maintenance required, i.e. no painting or upkeep like a wood shed is required. Shed walls, roof, and floor constructed using a paneling system for easier construction. Each panel segment on the sides, room and floor is about 2.5 ft. long. Doorway made with 3 panels, each about 3 ft. long. Doors come with stationery windows, internal spring latch, interior dead bolts, and exterior padlock loop. Side wall length: 244 inches. Overall height to the top of the roof: 112 inches. Roof length (including the overhang on both ends): 252.75 inches. Front Door Panel (and back panel) width: 108 inches. Exterior Wall Height: 78 inches. Floor Panel Width: 124.25 inches. Overall Footprint Dimensions: 124.25 inches wide x 244 inches deep. Floor panel thickness: about 3/4 inch. Approximate square footage: 200.8 square feet. Steel reinforcements used in the double-walled side panels. Steel framework for roof trusses used. Steel channels in the roof and walls help direct water out of the shed in the case of seepage at the paneling seams. 6 latch and lock shatter proof windows included. 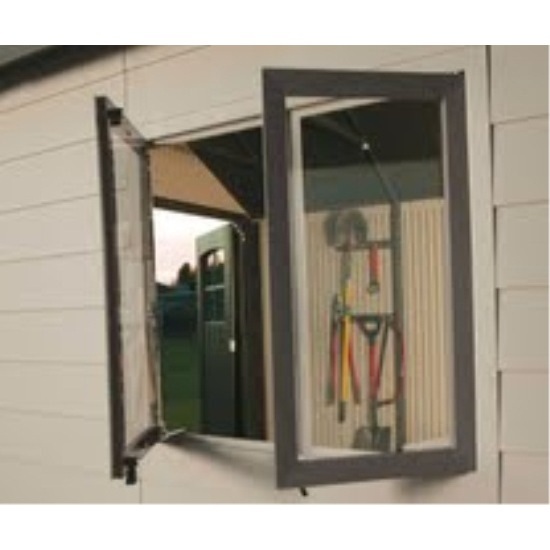 Windows can open half way to allow the Lifetime shed to ventilate. 3 stationery windows in the doors. 2 large bubble sky lights included. The floor of the shed is not a weight-bearing floor. Customer must have a support underneath the floor before use. Typically, a cement slab or wood framework is used. Call us if you have any questions. 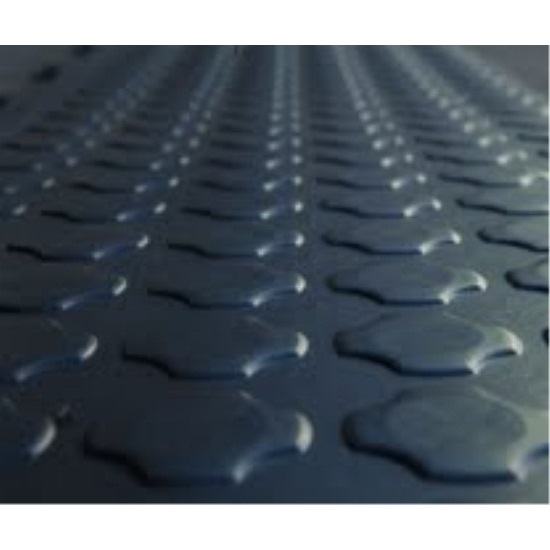 Floor panels are stain and slip resistant. 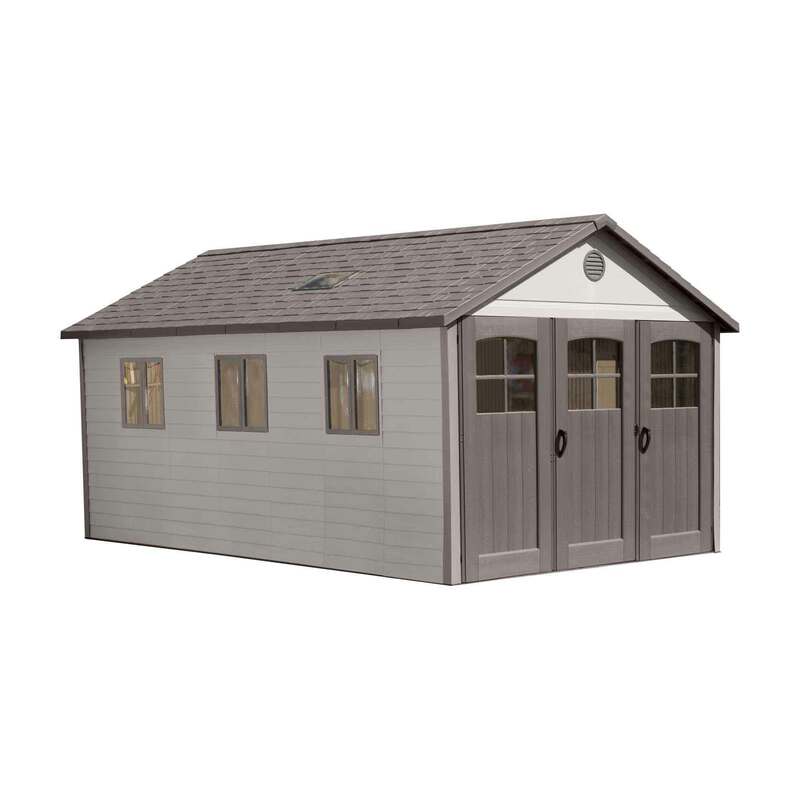 Lifetime Products warranties this shed for 10 years. 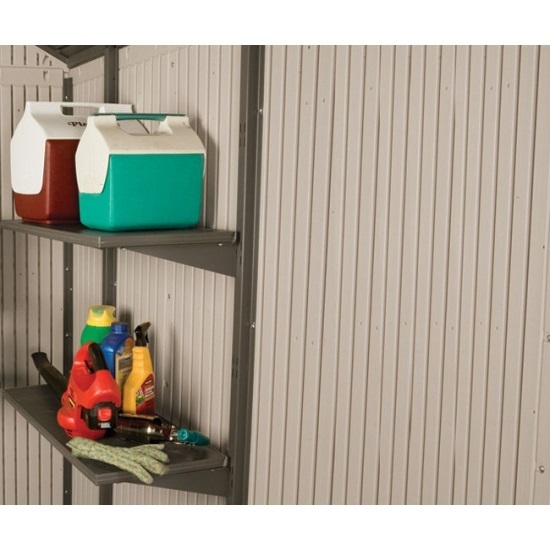 Comes with 2 30x14 inch shelves and 2 16 inch peg strips with hooks. Total shed weight: 1,496 lbs. Ships via an LTL carrier for a curbside delivery. This means the customer must be home to receive and sign for the product. The truck driver will unload it into the end of the driveway. Product ships as a model 6417, which is 5 boxes weight 904 lbs. with dimensions of 81 x 40 x 48 inches and also ships as 2 qty. 6426, which is 2 boxes weight 296 lbs. each with dimensions of 81 x 32 x 17.5 per box. Recent Changes made to model 60026: Changes have been made to the parts so the movement of the doors is more fluid. 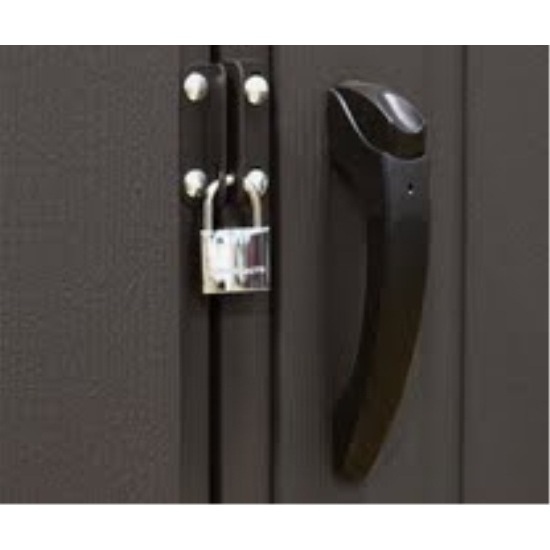 The hinge has been changed to a commercial hinge that is less susceptible to bending or opening up. The clearances and fits were improved. The left hand and right hand parts were combined to make universal fitting parts. The doors now open wider, due to a spring-loaded dead-bolt being used. All of these changes make the doors more convenient for the consumer to use and enjoy. We bought the 11x21 shed and its great. yes make sure your floor is level. read the instruction first and they are in Box 1 of 5. it took 2 of us over three days just because we didn't want anything missing. its a sturdy, nice looking shed. very happy with it. Now the down fall about it, you have to open every box for the floor. each box have 2-4 pieces of the flooring, each box has the walls and the roof. they should have had one box all the floor and 1 or 2 boxes the walls and the roof. it was a big mess in the yard. but oh well its up. I really needed the extra space to store motorcycles and bicycles as my 10x12 garden shed just was not doing the job. This building was easy to assemble by myself and was only a fraction of the cost of a wood framed structure. The big bonus is it looks great too! My husband and I really love this shed. It only took 5 days to get to us. Make sure they deliver with a lift gate, cause they are very heavy. You need 2 to 3 people to get the job done fast. We put a concert slab down, which help a lot. The owners manual can be hard to understand, but it all cones together. If it was noted which box the directions were in would have been nice. Mine was in the door box, after I opened all the other boxes. Construction notes: Pay attention to the instructions on the foundation being level and square. If the base is not level, the wall panels will not fit right. If not square, the floor will not fit right. The shed went together ok. Once I figured out how to assemble the trusses, the rest of the trusses went together easily. To assemble the trusses, attach the peak last. On the two end trusses, install with the nuts to the end of the shed. That way the eve braces are easier to install. I assembled the shed by myself over three days after the floor was laid. Be prepared to install lots of screws by hand. Do not use an electric screwdriver or you will strip out the plastic nuts. If I could have ordered the kit without them, I would have. The positives: Nice looking shed and feels real sturdy. The negatives: The skylight is a pain to install. 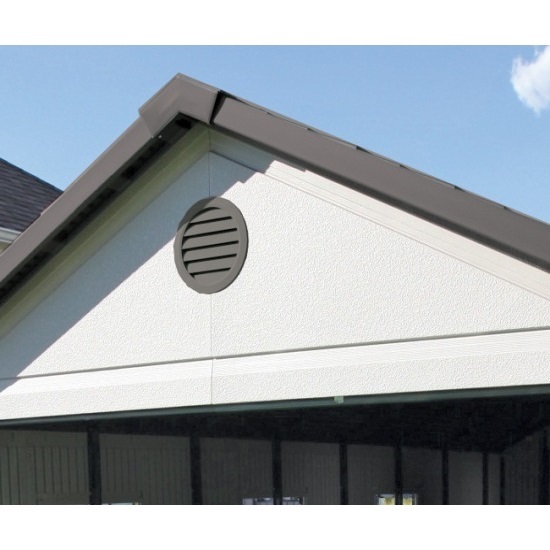 The smaller piece of the vented eve has the holes where the roof panel attaches are one inch off, both ends. The roof peak end cap does not fit at all. Some of the bolts used to fasten the door parts are too short and will not work. Do not overlap the seal on the skylight corners as the screws are not long enough to go through two layers of the seal. The window latches do not turn. You will either install them to allow the window to open or lock them shut. You will need a BIG MALLET to install the metal door edges. They do not slide on easily. Lastly, install the corner covers BEFORE installing the roof panels. If I had this to do again, I would install the shed on a slab. I used a cement block foundation with a 2x4 wood frame and 3/4 treated plywood as the sub floor. Q: Is the shed Paintable? Can you order it in different colors? Walls and Roof? A: It cannot be painted. These are the only colors available. Feel free to contact us with any other questions. Q: Do you make this shed 30 ft x 15 ft wide with less windows? 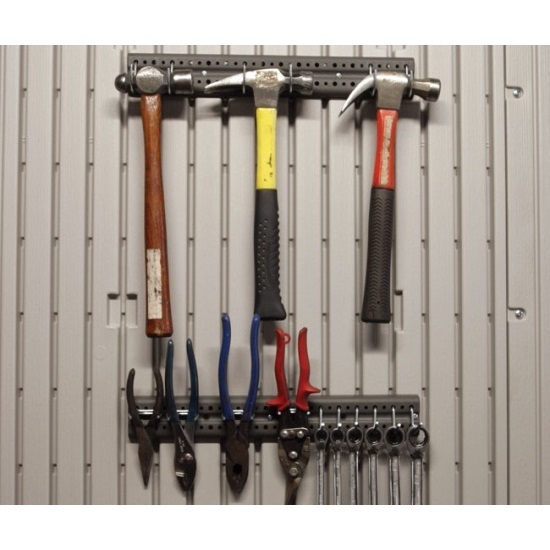 A: This is expandable in-depth, but the width is not customizable-it is fixed at 11 feet wide. Q: can you provide installation for the 21x11 ? A: We sell and deliver these, but do not do installation. For assembly I'd recommend Service Connection. They do installation in every zip code and they'll give you a quote if you call 855-544-8854. Q: Can this be ordered with doors on both ends? 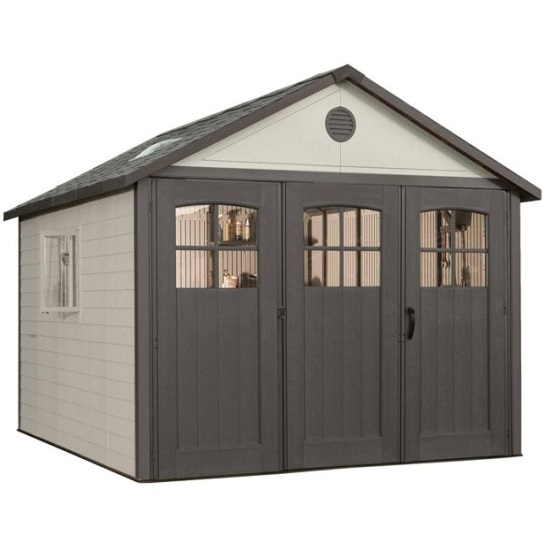 A: Unfortunately this shed is only manufactured with doors on one end. Q: What do I do regarding the floor- what prep is needed - do I have to put in a pad or other? A: The manufacturer recommends placing the shed on a flat structure such as a wooden foundation made of treated 2 x 4's and OSB board that you can pick up from your local home improvement store. The instructions show just how to build it and what materials are needed. The other recommendation is a concrete slab. The concrete slab is more pricey to erect. Some customers put it on cinderblocks, pea gravel, or other flat structures. The important thing is to make sure it is flat and drains well. If it isn't flat you may run into issues with your doors closing properly. Feel free to contact us with any other questions. 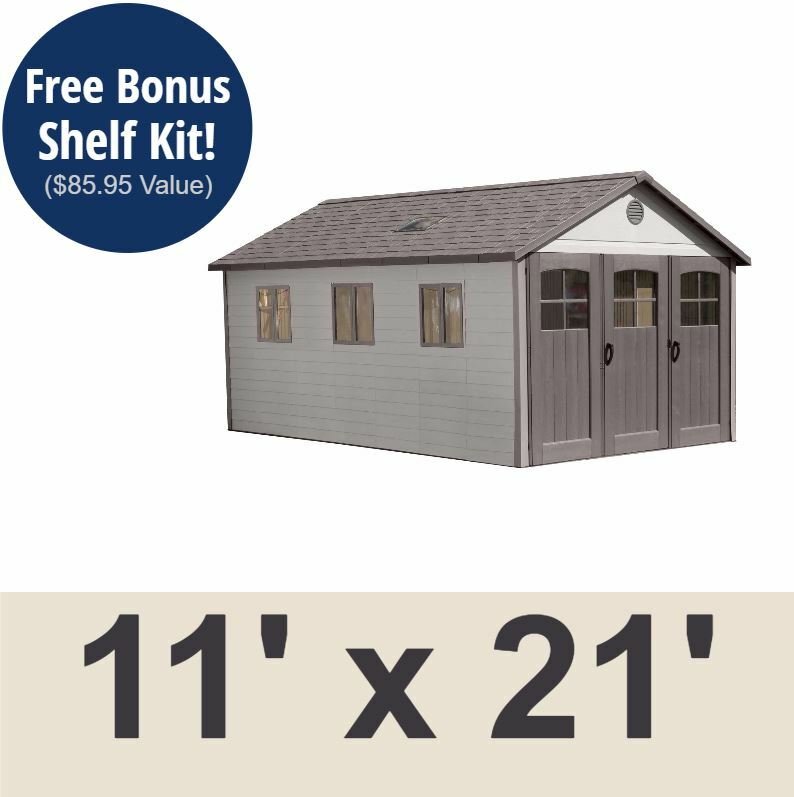 Q: Is this shed one piece 11 x 21 or does it come in a smaller size and takes additional pieces to make it 11 x 21? A: The panels are all 30 inches. It does not come assembled. Feel free to contact us with any other questions. Q: I assume it is necessary to have a concrete slab under the unit even though it has a floor, or are there other suitable options for an 11x31 unit? A: This shed must be built on a flat level foundation of wood or concrete (not included). Flooring must be anchored to the foundation. Wood will work just fine. Q: On the Lifetime model # 60026 - Why are you resuming shipping on: October 15, 2016? A: That means this item is out of stock for about two weeks. It is rare to have an item out of stock like this, but it will resume shipping on or around October 15. 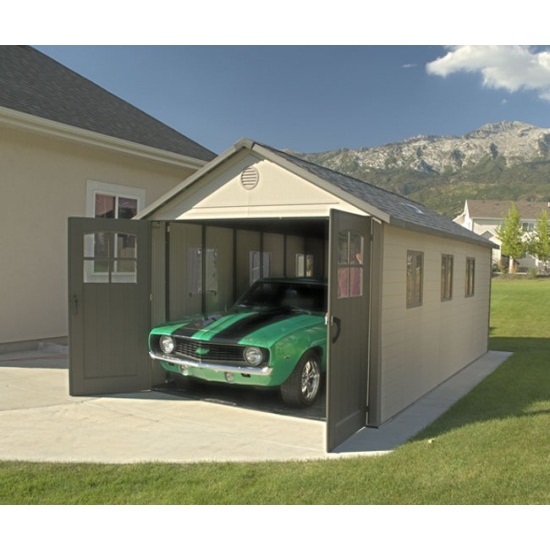 Q: Can this storage building be customized up to the 36-foot length? Thank you. A: Yes, you can add extensions up to 36 feet. If you scroll to the bottom you'll see the available extension kits. They extend the full length of the shed including the trusses, walls, and floors-as if you had purchased it at that final length. 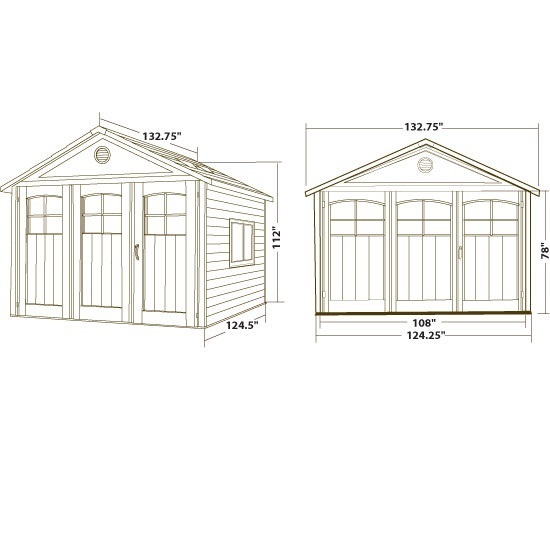 Q: Can this 11 x 21 ft garage shed be built to 11 x 36 ft.? Thanks! A: Yes, you just need to purchase the extension kits to expand it as long as you'd like. Q: Are these hurricane rated and impact resistant for South Florida? A: These are not hurricane rated and do not pass the code in Miami Dade County. We do have extreme weather kits and some customers purchase hurricane straps locally to reinforce these. Q: Can this be modified or do you have model, with the door in the front long wall instead of the end? A: On the 11 foot sheds the doors are always on the 11 foot side. The smaller sizes that are 8 feet or 10 feet can have them either on the 8 foot or 10 foot side, but the 11 foot sheds have to have the doors on the 11 foot side. Shipping: Orders for the 60026 Lifetime Storage Shed generally leave the warehouse the next business day. Shed model 60237 comes in 7 boxes. Box 1 is labeled 601871 and weighs 266 pounds, 81 x 32 x 12. Box 2 is labeled 601872 and weighs 242 pounds, 81 x 32 x 13. Box 3 is labeled 601873 and weighs 126 pounds, 81 x 32 x 8. Box 4 is labeled 601874 and weighs 142 pounds, 81 x 32 x 12. Box 5 is labeled 601875 and weighs 71 pounds, 80 x 39 x 6. Box 6 is labeled 6426 and weighs 296 pounds, 81 x 32 x 18. Dimensions: 83" x 81" x 40"